The FRONTLINE presentation at the BAVUG Meeting. Last Wednesday evening, I ventured into Burlington for the November meeting of the Boston Avid User Group. The evening's topic was managing media on the recent fast turn-around documentary "Egypt in Crisis". PBS FRONTLINE's Associate Director of Broadcast, Chris Fournelle, and Post-Production Supervisor, Megan McGough lead the discussion. 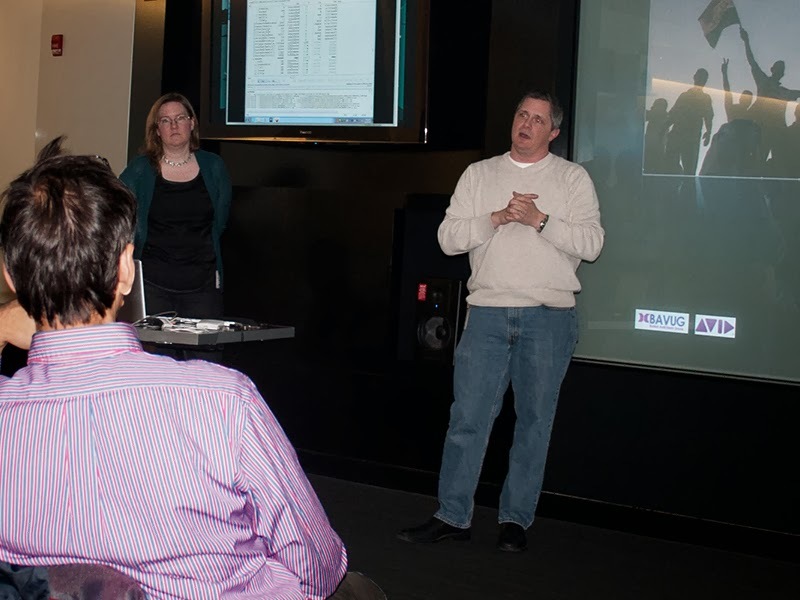 Chris and Megan described the post production workflows that were used for the Egyptian crisis stories covered in both 2011 and 2013. They discussed the challenges they faced in 2011, that allowed them to adjust their workflows to better manage the story they covered this past summer. The key to a streamlined workflow was in the organization of the file-based media from the acquisition stage. A standard naming scheme for all of the footage cards was determined ahead of time. This saved time in that the directory names would not have to be changed before ingestion into the Avid system. Very important in this naming structure, especially in cases of mixed formats, was to include the frame size and framerate in the directory name. This sped up the process of ingesting media into a project of its same type. All media was ingested at its native format and then transcoded to the format that would be used in the sequence. The editors at FRONTLINE cut in native Avid resolutions rather than AMA, this allows for faster exports and better collaboration (for my take on AMA, check out the AMA in the Avid Editing System blog from last June). When covering the story this past summer, Chris was on hand in Egypt to ingest the media as it was shot. Proxies were created of the media in the field and these proxies were uploaded for the editors in Boston. The editors in Boston were able to dowload those proxies and begin editing. When a final sequence was approved in Boston, a bin with a sequence was sent to Chris in Egypt. Once he had the final sequence, Chris could link that sequence to the full resolution media, make any necessary adjustments and output a full resolution sequence for broadcast. Having an established workflow form the start of production enabled FRONTLINE to significantly reduce the time needed from acquisition to air. Chris could not stress enough the need for fast drives. For their workflow, the transfer rates of media (cards, drives, uploads) was an extreme bottleneck. What is the Best Video NLE Out There?